It amazes me that often when I order a steak at different restaurants using the same terminology for the same type of steak, I often get different degrees of doneness. To me that just goes to show that a persons idea about what a steak should look like is as different as the steak involved. And it really should not have to be that way. The amount of time steak is cooked is a personal preference; shorter steak cooking times retain more juice and flavor, whereas longer steak cooking times result in drier, tougher meat but reduce concerns about disease. The best thing to remember is that before you cook a steak, let it come up to almost room temp. That means, DO NOT just take a steak out of the 41 degree fridge, slap it on the grill or in a pan and expect the cooking times to be the same. The ideal temp for a steak before cooking is about 55-60 degrees. So next time, take the steak out of the fridge about 30 min. before you cook. As long as you keep it on a clean plate covered and never out more than 2 hrs you should be fine. Also, never take out more than you will use. And always use safe handling practices to avoid cross contamination. Here are the most common steak cooking stages for a steak about 3/4 to 1" thick. Raw - uncooked. Unless used in special dishes, like steak tartare, steak is generally not eaten or ordered at this stage. However, it is becoming more and more popular. Blue - almost raw inside, but hot outside. Cooked very quickly. Inside is usually cool and not warm and definitely not cooked. The steak will be red on the inside. Cooking time: 1 minute each side. Resting time is about 2 minutes. Rare - red inside with plenty of red juices running freely. The outside is grey-brown. The middle of the steak is warm. Cooking time: 1-2 minutes each side. Resting time is about 3 minutes. 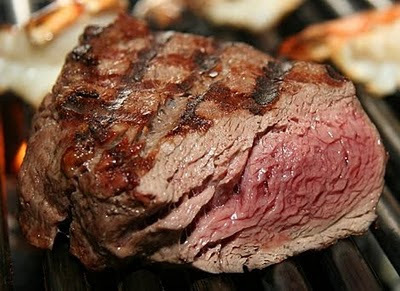 Medium rare – same as rare, but with few free-flowing juices and still red in the very middle. The outside is grey-brown. Cooking time: 2-3 minutes each side. Resting time is about 3 minutes. Medium - pink (fading to grey-brown) with juices in the middle. The outside is grey-brown. Cooking time: 3-4 minutes each side. Resting time is about 4 minutes. Medium well - the meat is grey-brown (or deep pink) throughout, still juicy. Cooking time: 4-5 minutes each side. Resting time is about 4 minutes. Well done - the meat is grey-brown throughout and slightly blackened or charred, but flesh still clear and juicy. Cooking time: 5-6 minutes each side. Resting time is about 4 minutes. Very well done - the meat is beige in the middle, not many juices remaining. Cooking time: 6-7 minutes each side. Resting time is about 3 minutes. What is resting time? Leaving meat to rest after cooking is very important. When you cook, the heat penetrates from outside and at higher temperatures the juices nearest the surface of meat are forced out. Resting your steak after grilling takes advantage of carry over cooking, allowing cooking to finish and internal juices to settle. Place your steak on a warm plate and cover with foil for resting.